Located on Aomori City land that is leased to the Aomori Horse Riding Club, Goshizawa Matsumori No. 4 site is a Jomon period residential site dated to the end of the Early Jomon and the beginning of the Middle Jomon period (ca. 3300 B.C.). The site was initially discovered by a member of the Riding Club during construction of a small kitchen garden, The Berkeley team excavation lasted for three field seasons (Summers 2008, 2009, and 2010), and the excavation area measured a total of 42 m2(see the photo above). Our efforts focused on a Jomon period pit-dwelling and three flask-shaped storage pits, all dated from the Lower-Ento d phase (the end of the Early Jomon period) to the Upper Ento-a phase (the beginning of the Middle Jomon period), as well as on a historic Heian period pit-dwelling. 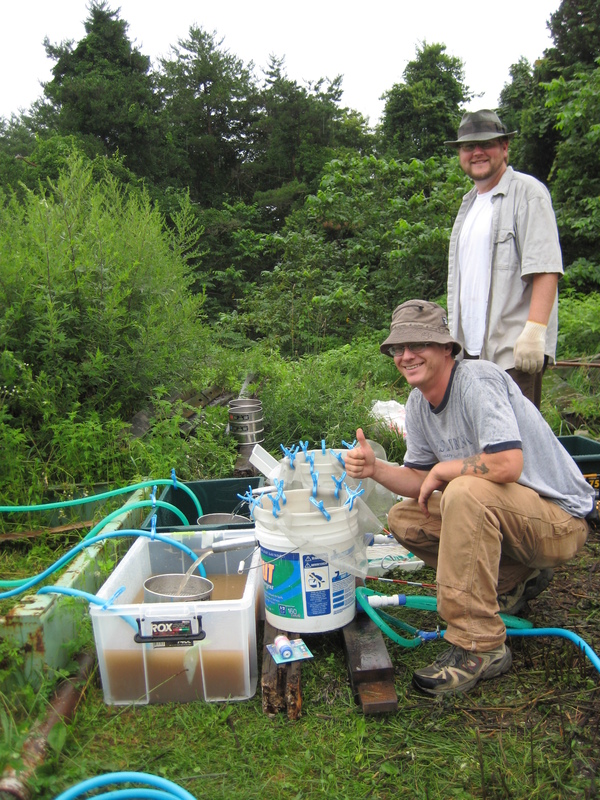 Soil samples were collected for flotation from 25-x-25-x-5-cm units. Logistical help and moral support from many local archaeologists and other stakeholders were key to the success of our field seasons. Charred plant remains retrieved from these samples include lacquer tree (Toxicodendron), Amur cork tree (Phellodendron), dogwood (Cornus), Japanese Angelica-tree (Aralia), elderberry (Sambucus), knotweed (Polygonum), and Goosefoot (Chenopodium) as identified taxa. Results of AMS dating indicate that 1) House 1 of the Goshizawa Matsumori is dated to ca. 3300-3200 BC, 2) the two storage pits from Goshizawa Matsumori are dated to approximately the same period, and 3) the Heian period pit-dwelling is dated to ca. 10th Cent. AD. The excavation was funded by the Understanding Lifeways and Biocultural Diversity in Prehistoric Japan, in conjunction with summer field school classes of UC Berkeley. 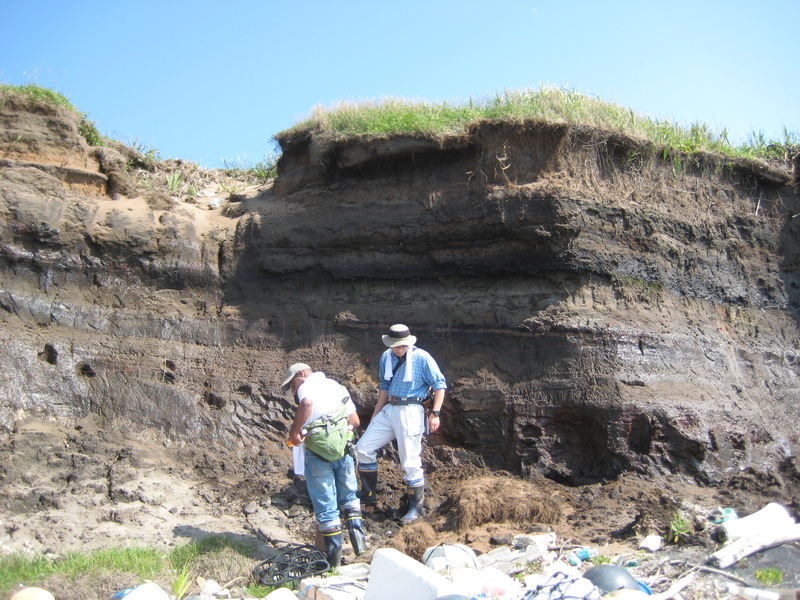 Excursion to Examine Sediment Layers with Prof. Suzuki, Tohoku Univ., 2008. 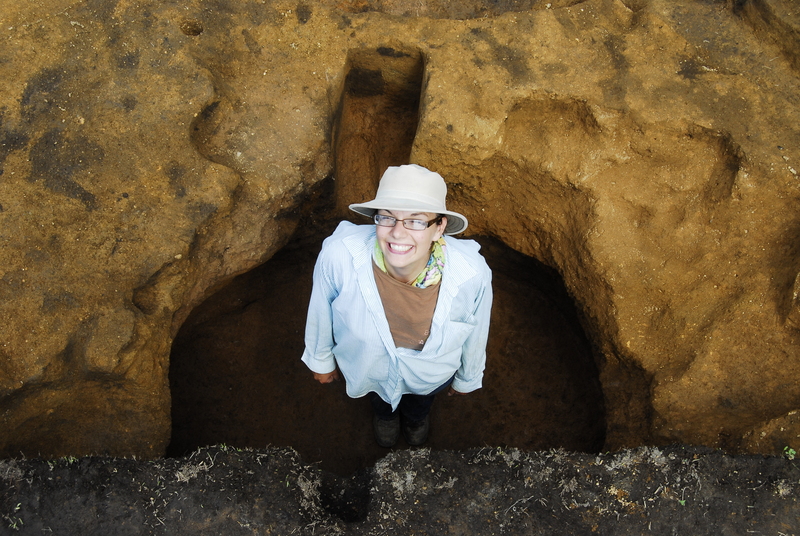 A student inside a Jomon storage pit, 2009. The excavation in progress, 2010.